The five February covers include Quantico’s Priyanka Chopra, How to Get Away With Murder’s Viola Davis, Empire’s Taraji P Henson, Veep’s Julia Louis-Dreyfus and Olivia Wilde, who will be starting in the upcoming HBO series Vinyl. 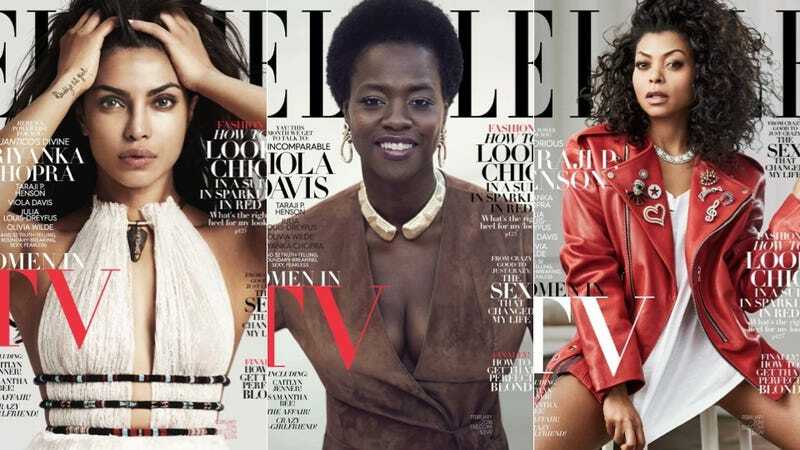 What I love so much about these covers is that ELLE didn’t have to go out of its way to showcase diversity because they already have great mainstream options to choose from. This whole machine works together: when you actually have diverse shows, the coverage around them is diverse and that helps raise the profile of the talent, which helps them get more roles. Here’s hoping next year maybe Fresh Off the Boat’s Constance Wu or America Ferrera, who is staring in the pleasantly hilarious Superstore, can get a look next year—and that this diversity will bleed over into film very soon. Try not to let this exquisite display of beauty and talent ruin your day.